/ How Do I Get Rid of Amazon from Ubuntu Launcher? How Do I Get Rid of Amazon from Ubuntu Launcher? I really like Ubuntu Linux and have grown to appreciate the Launcher. Except I don’t understand why there’s an “Amazon” app shortcut and don’t want it. How can I axe it? Windows has its TaskBar. MacOS X has its Dock. And Ubuntu Linux? It’s got the Launcher that (by default) is on the left side of the main window. They all serve the same basic purpose, offering a place where key apps and utilities can be launched with a single click and where running applications remain accessible even if their windows are closed or hidden. The difference is that the Mac and Windows versions are quite a bit more flexible, allowing you to drop a variety of apps, folders, even Web bookmarks onto them so you can customize it as desired. The Launcher is a much more constrained environment, which makes it all the more peculiar that Amazon somehow has its own Web site bookmark as an “app” within Ubuntu. A sponsorship? In any case, let’s have a quick look at how to get rid of the Amazon app button (e.g. Web site shortcut) on the Ubuntu Linux Launcher, then we’ll go through the steps of adding it back afterwards in case you change your mind. If you guessed “click on “Unlock from Launcher” you’re a winner! That’s it, app gone. You can launch any of them – and any other programs or files you have on your computer – directly from this point. 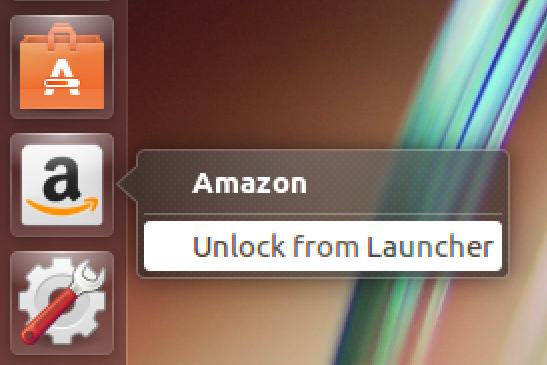 Launch the Amazon application and then right-click on its newly restored icon in the Launcher itself. Choose “Lock to Launcher”. And that’s it. Amazon shortcut restored, phew! Pro Tip: I’ve been writing about Linux forever and have tons of tutorials on the site. Please check out our extensive Linux tutorial library while you’re here. Thanks.